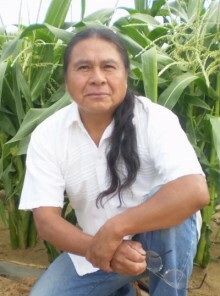 Hear multimedia producer Victor Masayesva Jr. (Hopi) deliver this spring’s Simon Ortiz/Labriola Center Lecture on Indigenous Land, Culture and Community. Masayesva’s topic is “Indian Time,” a talk, discussion and film screening. More information about Masayesva and the lecture. Click here for a feature story about Masayesva written by Arizona State University’s Kristen Larue and posted on ASU News. “A member of the Hopi Tribe from Hotevilla, Ariz., Victor Masayesva Jr. has been a lifelong advocate for the ascendancy of the indigenous aesthetic in multimedia productions. He has promoted this aesthetic by curating programs at the Museum of Modern Art in New York City and serving as artist-in-residence at the School of Art Institute of Chicago, Walker Art Center, Banff Centre for the Arts and featured director and jurist at the Yamagata International Film Festival, and the CLACPI Festival in La Paz, Bolivia. This event is co-sponsored by the Heard Museum and Arizona State University.